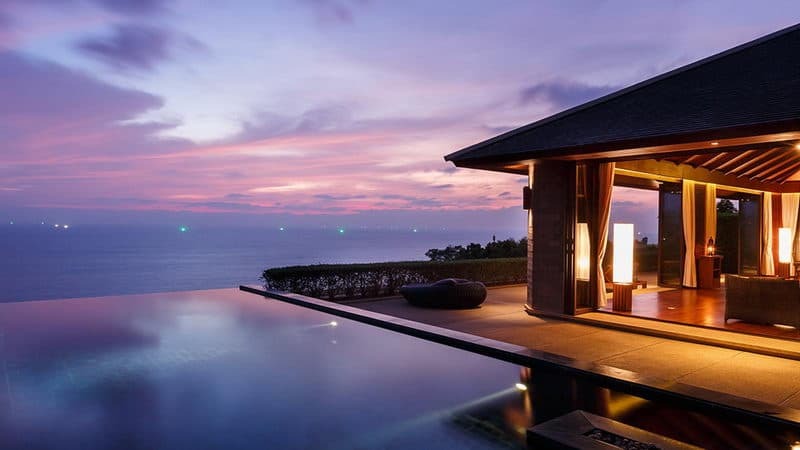 See Top 10 best five-star Luxury Hotels in Phuket. Rating from luxury vacation packages, outdoor private pool, stylish decoration, spa and golf resorts to safari getaways. All are convenient to transportation and shopping. 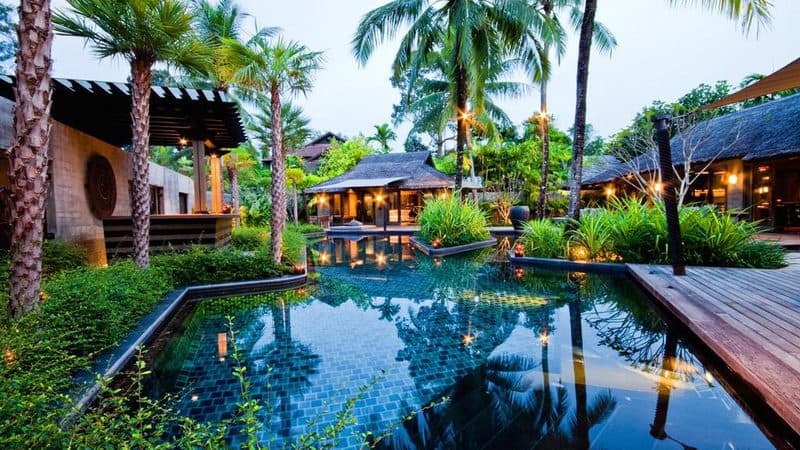 It is an exclusive selection of luxury hotels in Phuket, charming hotels to be remembered once back from your holiday. 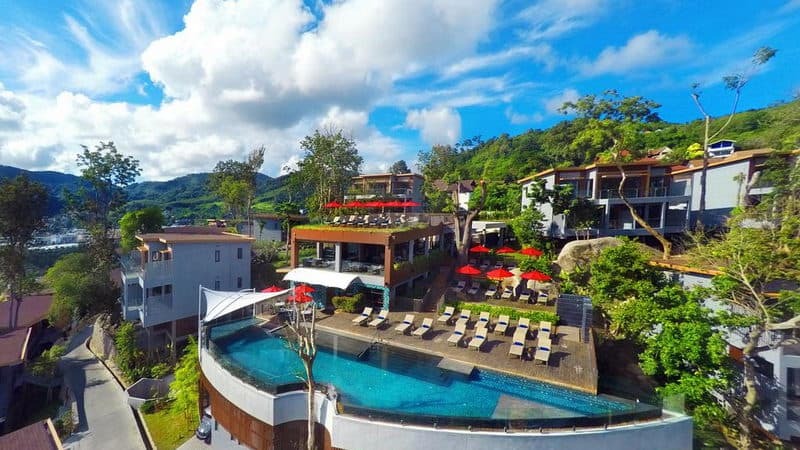 The Slate resort is only 5-minute drive from Phuket International Airport, and only 10-minute drive from Blue Canyon Golf Course and Mission Hills Golf Club Golf Club. The beach is 3-minute walking distance from the hotel. The Slate resort's location makes it luckily to have the beauty of Nai Yang Beach and the Andaman Sea as the background. It has a unique industrial design, provide sea view rooms, SPA and 3 outdoor swimming pool. The air-conditioned rooms feature unique decoration with original artwork and locally made furniture, with gorgeous wood and cool stone decorations. All rooms are equipped with flat screen TV, free Wi-Fi and bottled water. Phuket Amar Ree Hotel is the quality of choice with its location in central Phuket. This 4-star accommodation only 40 km away from the airport and the traffic is convenient. It is also very near to the Malin Plaza Patong and John International Tailor etc. popular attractions. Amar Phuket provides quality and considerate service as well as convenient facilities, which wins high praise from the guests. During their stay, guests can enjoy 24-hour room service, free Wi Fi in the room, 24 hours of security, taxi service, ticket service. Guests can also enjoy free tea, slippers, separate living room, wireless Internet, wireless Internet (free of charge) and other facilities. Accommodation is equipped with badminton, Jacuzzi, sauna, fitness center, outdoor swimming pool and other recreational facilities, all those will let you enjoy yourself so much as to forget to go home. Ibis Phuket Patong has only a 5-minute walk from the beach. The Hotel is located in the quiet area of Patong, with a convenient location. It takes 10 minutes on foot to reach Bangla Avenue, and 5 minutes to reach the beach. The hotel provides different tastes to guests and leisure facilities, including the giant swimming pool as well as a complete entertainment service. You can rent a bicycle to explore the surrounding area, or the use of car rental facilities for longer distance travel. You can relax in the modern guest room, then set apart to the nearby shopping center. And the beach in the nearby keeps waiting for you. The nightlife in Patong is also in the vicinity of the hotel, but not too close, to avoid the noise disturbance. The Thai restaurant in the hotel is influenced by the style of the Spanish restaurant. You can choose any kind of food for your dinner. After dinner, come to the bar to have a favorite drink. The hotel provides drinks and snacks for 24 hours. 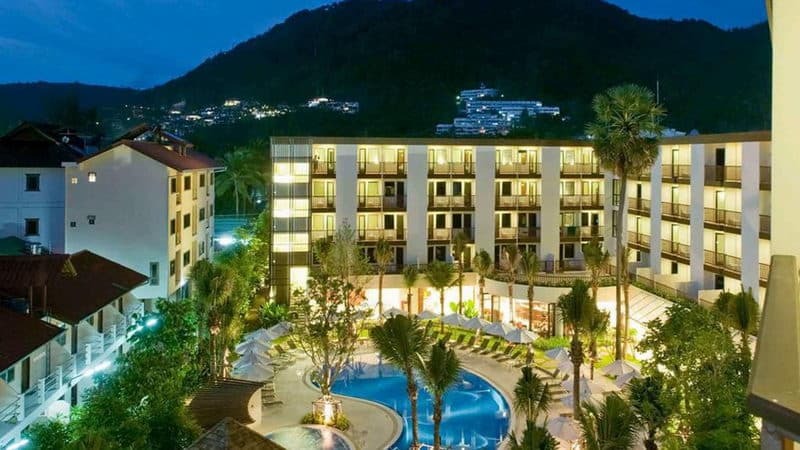 La Flora Resort Patong is located in Phuket Island Patong Beach and is very popular for tourists. Here, guests can easily go to the tourism, shopping, dining place in the urban district. This modern hotel locates near the banana Walker shopping center and Gelalu class and other popular attractions. Patong flower resort always dedicated to provide you with first-class facilities and distinguished service to make sure you stay here is happy and comfortable. Entering one of 67 comfortable rooms, you will leave the troubles and pressure behind. All room provides flat screen TV, some rooms with bathroom hanger, telephone, free Instant Coffee, free tea and other facilities. In addition, the hotel entertainment facilities will make you enjoy more fun in the stay. All aspects are ideal for a pleasure Phuket tour. 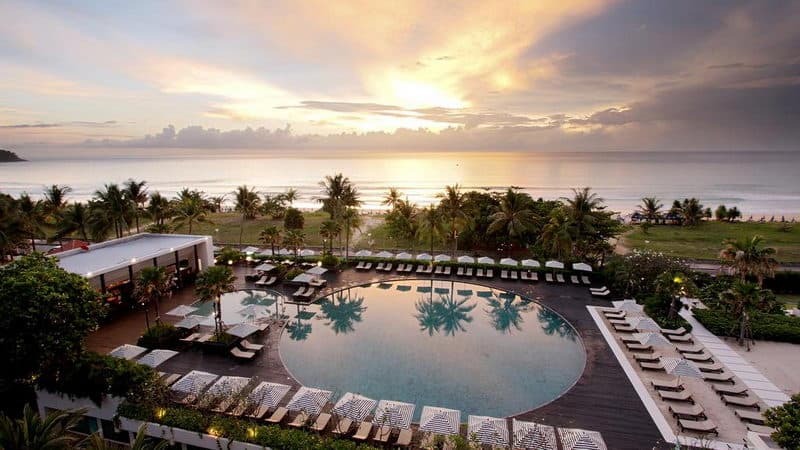 Paresa Resort Phuket is designed particularly for business and leisure tourists. It is located in the Kamala Beach area and is one of the popular hotel. Here, guests can easily go to the tourism, shopping, dining place in Phuket Town. Natural environment here is good and close to Boss Tailor, tsunami monument, space rolling ball and other attractions, all of which makes the hotel unique. The resort provides quality and thoughtful service and convenient facilities, which wins high praise from the guests. The special services of the hotel facilities include 24 hours room service, free Wi-Fi in the room, 24 hour reception, the wireless network (public areas), parking lot. The hotel has 49 well-decorated rooms, most are equipped with a flat screen TV, extra bathroom, toilet, bathroom phone, clothes hanger. The hotel also has fitness center, outdoor swimming pool, indoor swimming pool, spa, massage, which are wonderful relax for body and mind after a busy day. 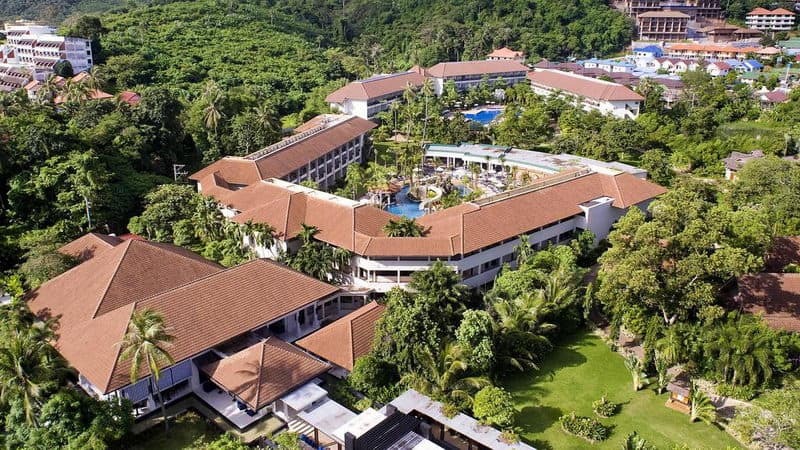 Centara Karon Resort Phuket hotel is 45 minutes' drive from Phuket International Airport and is 15 kilometers from Phuket Town. The Karon Beach is only 4-minute walk from the hotel. The resort has four residential areas, three outdoor swimming pools and six dining options. The hotel offers free parking lot. The Centara Karon guest house has modern Thai style. Each room has satellite TV, fridge and tea, coffee machine. Guests can enjoy massage services at the SPA Cenvaree spa, or exercise in the fitness room. The hotel can arrange bungee jumping or karting for guests. The rest of the hotel facilities includes tennis courts and children's recreation centres. Lotus restaurant provides buffet breakfast. Guests can enjoy snacks in the Azure restaurant beside the pool, or to the Mix lounge for cocktail. Three poolside bars-Tropix, Lagoon and Terraces-provide various snacks. Le Meridien Phuket Beach Resort is located in the tropical landscape, from the bustling Patong Beach (Patong Beach) is only 5 kilometers, from the golf course, less than 15 kilometers and from Chalong Temple and the shooting and paintball range 20 kilometers, from Phuket Island International Airport (Phuket International Airport) is a 45-minute drive. This magnificent Seaside Resort has its own private beaches and a large outdoor swimming pool surrounded by air-conditioned rooms, offering many fitness options, daytime Spa, and 10 dining places and bars. The standard facilities of each room includes 1 sets of 37 Inch Flat screen TV and a private balcony and wooden floor. Other amenities include tea / coffee facilities, free Wi Fi and a bathrobe. The gym, tennis courts and sports courts facilitate the daily exercise of the guests. The resort also offers a variety of water sports, concierge services and children's clubs. The dining features include a daily beach barbecue with the use of freshly caught seafood and various Italy pizzas served by La Fiamma. The hotel also has a Japanese restaurant and a seaside bar. 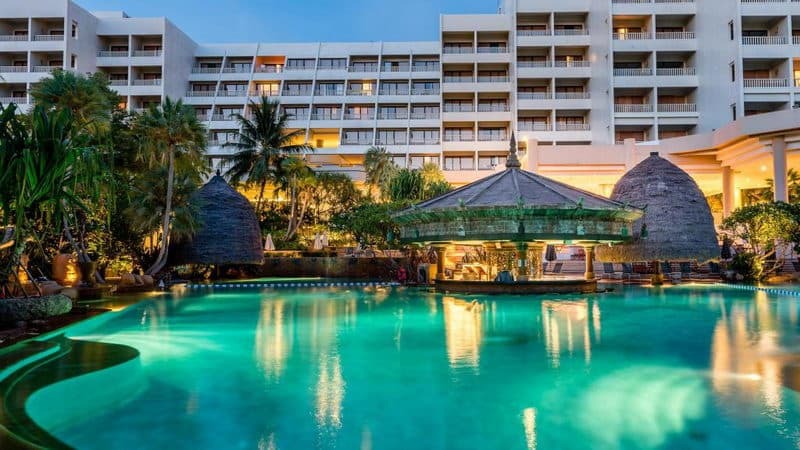 Hilton Phuket Arcadia Resort & Spa is located on Karon Beach and is 5 kilometers from the Wat Chalong coast and 1-hour drive from Phuket Island International Airport. The resort provides free parking lot. Each guest room of Hilton Arcadia resort is surrounded by a beautiful tropical garden, enjoying the magnificent view of the sea and providing easy & delightful accommodation experience for the guests. 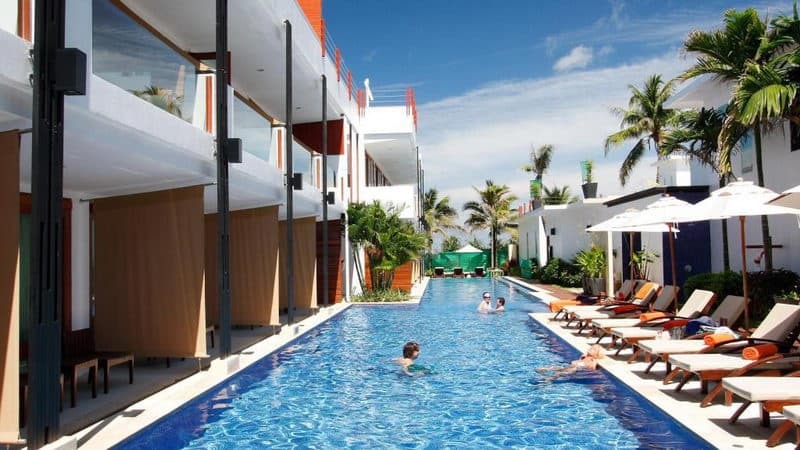 The resort hotel has 3 outdoor swimming pool, free scuba diving courses and five-star fitness facilities. Guests can enjoy the magnificent views of a gentle hillside or ocean on a private balcony or in a comfortable lounge area with flat screen TV, solid wood flooring and bathtubs. Spa provides a relaxing massage service for children. Children can play at Kidz Paradise. Other recreational facilities include mini golf, tennis courts, and a fully equipped fitness center with French windows. Guests can enjoy a sumptuous buffet breakfast at Boun Appetito to start a new day. In addition to the swimming pool bar and lounge, featured restaurants include Thai Thai Restaurant and Thai Sails Restaurant which supplies award-winning cocktail. 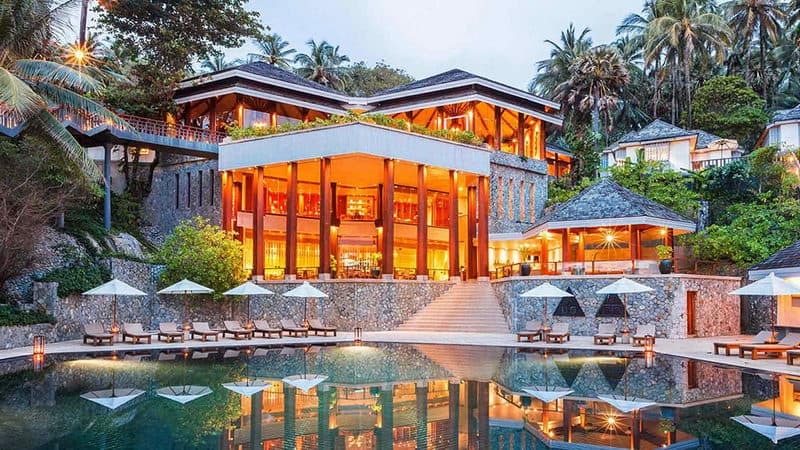 Mövenpick Resort & Spa Karon Beach Phuket is located in the southwest of Phuket Island, is a luxury five-star hotel and tropical summer resort with 4 outdoor swimming pools, 5 restaurants and a fully equipped gym. The Karon Beach is only 1-minute walk from the hotel. 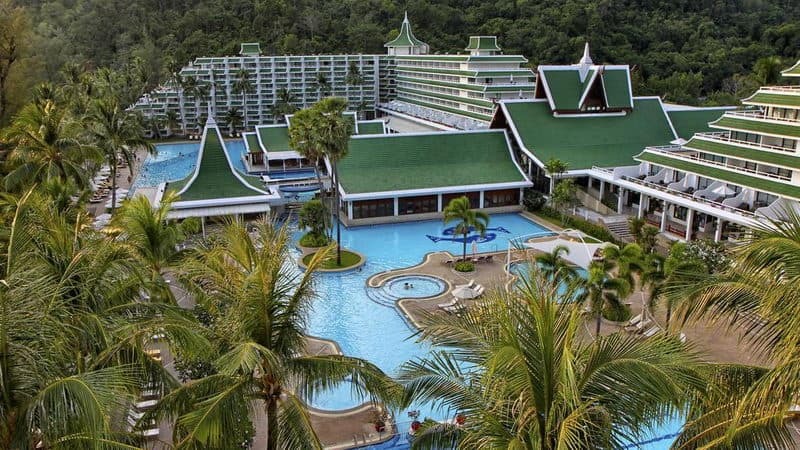 The resort is just 15-minute drive from popular Patong Beach and Jungceylon Shopping Centre and 30 kilometers from Phuket International Airport. The resort features with its modern Thai style decoration and enjoy Thai ocean or garden, equipped with a cable / Satellite TV and mini bar. The resort provides a comfortable massage physiotherapy service. The Play Zone offers DVD lounge and game entertainment options. The Game Lounge provides a billiard table and table tennis table. Pacifica Restaurant provides full catering service and breakfast buffet. Café Studio offers delicious dessert and coffee. Other dishes include Brazil and Asian delicacy.